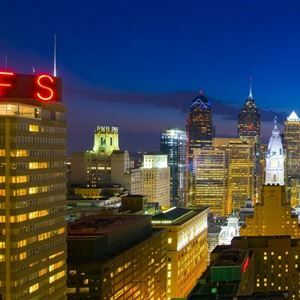 Property Location With a stay at Loews Philadelphia Hotel, you'll be centrally located in Philadelphia, steps from Lowes Philadelphia and Reading Terminal Market. This 4-star hotel is within close proximity of Pennsylvania Convention Center and Jefferson University Hospital. Rooms Make yourself at home in one of the 581 air-conditioned rooms featuring iPod docking stations and flat-screen televisions. Your room comes with a pillowtop bed. Complimentary wired and wireless Internet access keeps you connected, and cable programming provides entertainment. Private bathrooms have complimentary toiletries and hair dryers. Amenities Enjoy a range of recreational amenities, including a health club, an indoor pool, and a sauna. Additional amenities at this Art Deco hotel include complimentary wireless Internet access, concierge services, and gift shops/newsstands. Getting to nearby attractions is a breeze with the area shuttle (surcharge). Dining Grab a bite to eat at the hotel's restaurant, which features a bar, or stay in and take advantage of 24-hour room service. Quench your thirst with your favorite drink at a bar/lounge. Cooked-to-order breakfasts are available daily from 6:30 AM to 11:30 AM for a fee. Business, Other Amenities Featured amenities include complimentary wired Internet access, a 24-hour business center, and express check-out. Event facilities at this hotel consist of conference space and meeting rooms. A train station pick-up service is available for a surcharge. With a stay at Loews Philadelphia Hotel, you'll be centrally located in Philadelphia, steps from Lowes Philadelphia and Reading Terminal Market. This 4-star hotel is within close proximity of Pennsylvania Convention Center and Jefferson University Hospital. Make yourself at home in one of the 581 air-conditioned rooms featuring iPod docking stations and flat-screen televisions. Your room comes with a pillowtop bed. Complimentary wired and wireless Internet access keeps you connected, and cable programming provides entertainment. Private bathrooms have complimentary toiletries and hair dryers. Enjoy a range of recreational amenities, including a health club, an indoor pool, and a sauna. Additional amenities at this Art Deco hotel include complimentary wireless Internet access, concierge services, and gift shops/newsstands. Getting to nearby attractions is a breeze with the area shuttle (surcharge). Grab a bite to eat at the hotel's restaurant, which features a bar, or stay in and take advantage of 24-hour room service. Quench your thirst with your favorite drink at a bar/lounge. Cooked-to-order breakfasts are available daily from 6:30 AM to 11:30 AM for a fee. Featured amenities include complimentary wired Internet access, a 24-hour business center, and express check-out. Event facilities at this hotel consist of conference space and meeting rooms. A train station pick-up service is available for a surcharge.